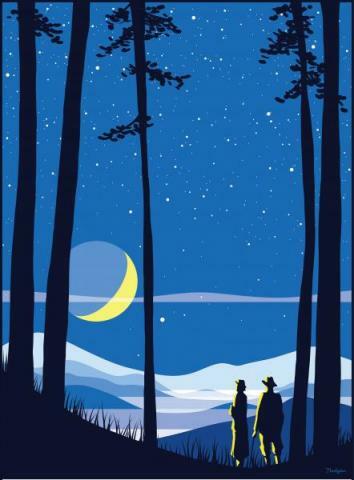 Join the Schiele Museum’s James H. Lynn Planetarium for the 7th Annual Statewide Star Party! Learn about the endless wonders of the April cosmos during a live star show inside the planetarium’s dome theater, then step outside and discover these celestial sights for yourself using the planetarium’s telescopes. Trained staff will be available to show you how the telescopes work and direct you to the more interesting astronomical sights as you join people from across the state to gaze upon the stars. As part of the evening’s events, we will be looking ahead to the 50th anniversay of the Apollo XI Moon landing. Learn about the important steps taken here on Earth to prepare for the historic "one small step" onto the lunar surface. Hands-on activities will be available for stargazers of all ages to help appreciate and better explore the cosmos. The planetarium show and live guided tour of the night sky will begin at 7:30pm inside the full-dome theater. After sunset, everyone is welcome to step outside and gaze at a selection of the night sky’s offerings through a variety of our telescopes. Outdoor observing is estimated to begin at approximately 8:30pm. Telescope viewing is an outdoor activity and dependent upon the weather. Please call the Schiele Museum at 704-866-6900 or visit our Facebook page on the afternoon of the event to ensure that telescope observing will take place. Indoor activities, including the preview show and live tour of the night sky, will take place regardless of weather. The James H. Lynn Planetarium is located at 1500 East Garrison Blvd. in Gastonia, NC – less than 30 minutes from Uptown Charlotte. Admission to the April 13 Star Party is $5.00 for everyone over 3 years of age. For more information, call 704-866-6900, visit www.SchieleMuseum.org, or like us at Facebook.com/SchieleMuseum to stay up-to-date on upcoming events.